I can’t imagine going back to regular corn after tasting this sweet and spicy combo. My dad has a fail proof microwave method (no dealing with pesky silks) and then I grill it afterwards to get the brown charred kernels. I have to believe this would also be incredible slathered on salmon! This is my Dads quick microwave corn method – and it’s a huge success. Keep husks and silks on the corn. Cut the bottom and top off the corn. For each ear of corn, add 3 minutes to the total time. 6 ears of corn will cook a total of 18 minutes. Place corn in microwave and cook for 9 minutes. Turn corn over and cook another 9 minutes. 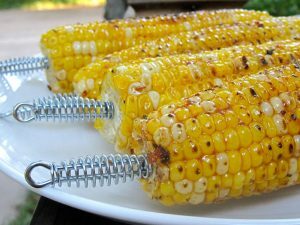 (You can prepare the corn up to this point and wait to clean until ready to grill with the glaze). Remove the husks and silks. Prepare barbecue (medium heat). Brush corn with some of glaze. Grill until lightly charred in spots, turning frequently. Transfer corn to platter. Brush corn with remaining glaze. Sprinkle generously with salt and serve. Looks wonderful! I'll have to try this one, too. You should audition for the American version of MasterChef! !